If there’s something strange in your neighborhood? If there’s something weird and it don’t look good? If you’re seeing things running through your head? An invisible man sleeping in your bed? Who you gonna call? … What if you need to reset your password, the printer doesn’t work, you can’t update adobe reader, you can’t access the network, or your computer freezes? Who you gonna call? Ghostbusters?! No! Thanks Ray Parker, but no you gonna call the help desk. As you may already know, and I hope that you know, the help desk is a critical part of customer service. These are the super heroes that fix the problems for your customers who are probably extremely frustrated. Resolving your customer’s issues, ASAP, greatly increases customer satisfaction, which, in-turn, positively impacts future sales. To put it another way, having an excellent help desk service impacts the life of your company. Typically reached via a toll-free phone number, help desk support is now using the web to support customers via chat tools and social networks. Usually companies starting out use a single tier customer support system: a single point of contact to handle queries or solve problems. However, as a company grows they tend to need more than just a single tier model. This means they move to a multi-tiered support system. For instance, if you are selling project management software to businesses, you could get queries like, I forget my username and password, what do I do? Or, how do I to deal with a bug that is preventing me from time tracking on an iPad. In the latter case, you need experts to solve this bug issue. While in the first case, a less complex query about usernames and passwords would not require a programmer. When you have proper tiers set up in your help desk support, it helps allocate support resources to meet customer needs. This is the basic level of customer support. The customer representative is a generalist with a broad understanding of the product and may not understand the inner workings. In this case, they would identify a customer’s needs and provide tips on how to manage a problem. Typically, these solutions are in a FAQ or a knowledge base. Employees at this tier use a knowledge base in a majority of customer calls. Tier-1 support usually provides a 24-hour service and is outsourced to a 3rd party. When a tier-1 support employee is not able to resolve the issue, they classify the problem and pass it on to the appropriate tier-2 employee. At this point, an issue tracking ticket is issued to the customer. Tier-II support involves technical knowledge and is staffed by technicians who have troubleshooting capabilities beyond the tier-1 employees. The tier-II help desk employees are staffed by either the company involved or outsourced to a 3rd party. The technicians tend to have a specialization and will determine which specialization best matches the customer’s needs before helping him. If their technical specialization is one that can help the customer, the tech then determines whether this problem is a new issue or an existing one. Advanced diagnostic tools and data analysis may be done at this point. If the issue is an existing one, the tier-II specialist then finds out if there is a solution or a workaround in the database. The customer is then told how to fix their problem. However, in some cases there might be no solution as it’s an open bug. In that case, the tier-II desk adds an entry to the bug list. Then, depending on the number of instances where customers are experiencing the same problem, the help desk could ask the developers to fix the bug. If a customer experiences a new issue, further analysis has to be done to see if it can be dealt with. 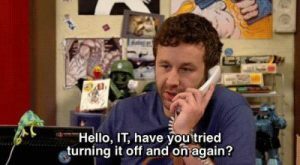 The help desk employee would then explain to the customer how to fix their issue. However, if the tech cannot fix the problem at this tier, the problem goes to tier-III. At this tier the problem is assigned to a developer at the company responsible for the product. Tier-III requires a person who has specialized skills over and above the work the techs do in tier II. This support is usually provided by the specialists involved in product development. They deal with complex issues. To solve the problem, they will collect as much data as possible from the employees at tiers 1 and 2. In my previous job as a developer at Microsoft in the Windows OS team, I used to get the harder bugs in the operating system passed on from support personnel around the world and from the crash dumps you report when an application stops working. Sometimes fixing the problem involves a deeper analysis of the operating system. Fixing the problem may require a Windows update. This tier only exists in a multiple vendor case. For instance, if you’re an app developer and the issue involves fixing the problem on an OS mobile level provided by another company, you simply request support from the other company. Balaji Viswanathan is the founder of Agni Innovation Labs that helps startups and small businesses with their marketing and management strategy. He has been blogging for the past 8 years on technology, finance and business related topics. i am very interested in your post. and this info is more useful for the software companies. Thanks for share this valuable post. Thanks Stephen. I’m glad that you found the post useful. Feel free to post any questions regarding this. Hello Balaji, Thanks for the post as this is useful. I am looking for a Checklist to Audit NOC in my Org. Any help? Is there an authoritative industry source for help desk tier defintions? I cannot find a definition of help desk tiers from ITIL after much searching. I´m looking for a real definition of skills and competencies that a person must have for each service level support (level 1, level 2 and level 3), based on ITIL. I need to define a profile for each level for a study case. There is a newerer and evolving Tier to consider adding to your list. Tier 0 or Level 0. AKA Self-Service which is preferred by younger and tech savvy older workers that desire an instant fix or easier path to issue resolution or trouble ticket creation. Typically they avoid calls to a help desk whenever possible. AetherPal has made available Valet which is a Mobile SaaS APP for enterprises with mobile devices deployed in BYOD and Corporate Owned and Liable scenarios. Even if their fleet of devices is managed by an MDM/EMM the mobile user beenfits from a single point of contact to the ITSM and Help Desk but most importantly can view tutorials within their APP for device, APP and OS issues that generate most Help Desk calls. When needed the powerful Remote Support feature can allow screen sharing and or complete control of an attended device. With over 60% of all internet traffic now via mobile this solution improves the user experience and allows the Help Desk to scale to meet the new mobile demand. Necro bump…Tier 0 (Self help) tend to create more issues than it resolves. I run into the user that thinks they know IT and they end up doing more harm than good. A ticket is almost awlays put in and more work to correct what they messed up. Thank you for sharing this valuable article. I was looking for some basic model info on the same and this articles served the purpose of clarifying my understandings on CS support. Definitely helpful post! Thanks for sharing. Actually I´m looking for a true definition of skills and competencies that an individual should have for every service level support (level one, level 2 and level 3), based on ITIL. I need to outline a profile for every level for a study case. Have you any recommendation? IF yes share please. How long should it take Level 1/2/3/4 to resolve a case or call. What are the industry standards time to resolve a case at each level?